Abstract: Brownie, a 41 year old male castrated Quarter Horse with severe carpal osteoarthritis and suspected degenerative joint disease, showed a short term increase ambulation, improved gut function and better body carriage after three acupuncture sessions with dry needles. History and Presentation: “Brownie” is a 41 year old male castrated Quarter Horse previously used for roping and cattle work. Brownie is pastured on rolling hills with several beef calves and a run-in shelter. 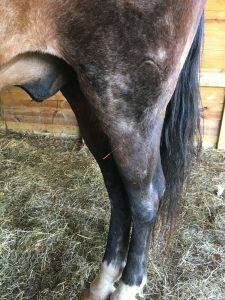 He had four incidents last winter of being down in the pasture, and unable to arise without assistance. 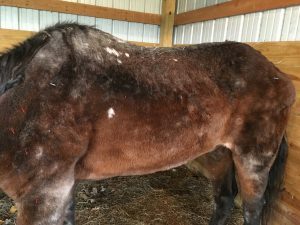 His teeth were floated in the fall of 2016, and feet are trimmed every seven to eight weeks. He had one incident of mild impaction colic over the winter that responded to oral flunixin meglumine and tubing with mineral oil. The horse receives two grams of phenylbutazone after days of being down or if he has a harder time walking, and is maintained on joint supplements (mainly glucosamine/chondroitin and methysulfonylmethane). Brownie presents for treatment to address his stiffness and occasional difficulty walking in the pasture. Physical Examination, Clinical Assessments: Physical examination showed normal findings in the cardiovascular, gastrointestinal and nervous systems. Oral examination had incisors and remaining premolars and molars showing extreme wear. Musculoskeletally, there was severe bony remodeling of bilateral carpi; both joints are grossly thickened with greatly reduced range of motion. Bilateral stifles and hocks had resistance to flexion and crepitus with minimal palpable bony changes. Myofascial palpation revealed taught bands of tension along the entire dorsal and caudal ventral cervical neck muscles, pectoral muscles, muscles of the scapulae and triceps, epaxial muscles (along inner bladder line), lumbar and sacral region, hip flexors, pelvic limb extensors and all gluteal muscles. Body Condition Score was 3/9. Medical Decision Making: All three treatments followed the same approach, dictated by the presence of taut bands and trigger points secondary to the chronic pain from osteoarthritis. My goal was to reduce overall muscle tension and stiffness to reduce the ongoing pain-wind up phase, help reduce active and ongoing inflammation secondary to arthritis, and drive the body towards a more parasympathetic tone for better digestive health. Needling the bands of tissue and trigger points stimulated the collagen fibers to affect fibroblasts and extracellular matrix in the fascia to influence the local peripheral nerves, which then synapse up to a specific spinal cord segment via the dorsal horn which synapse with different areas of the brain and brain stem to initiate the somatosomatic reflex arc to promote direct muscle relaxation, and promote analgesia by stimulating the release of neurotransmitters. Direct mechanical pressure on the trigger points helped override the C afferent nociceptors, signaling for pain, by stimulating the A delta nociceptors. Digestion is improved through somatovisceral reflexes arising from stimulation along the lumbosacral area, along with the reduction of chronic pain. Differential Diagnoses: Degenerative joint disease and osteoarthritis with compensatory muscle stiffness and decreased mobility based on bony remodeling, gait, and history. Definitive Diagnosis: The effects of arthritis were temporarily mitigated based on the patient’s response to alleviated muscle pain through improved body carriage, gait and muscle tone. Acupuncture Treatments: The treatment plans included these following points addressing local pain in the associated muscles and tension in all three sessions; Bladder (BL) 10, BL 13, BL 18 (at the 14th intercostal space), BL 21, BL 25, BL 54, Bai Hui, Small Intestine (SI) 9, SI 11, SI 12, Gallbladder (GB) 21, 29, GB 30, Large Intestine (LI) 11, LI 16, LI 17, LI 15, and Triple Heater (TH) 14. All the Bladder points, Bai Hui, and GB 21 were also chosen in all three sessions to help stimulate the sympathetic nervous system to promote the release of endorphins to cause relaxation and improve resting organ function, such as digestion. For the first session, additional points were utilized. BL 18 (13th ICS) and BL 27 provided additional local pain relief. Lung (LU) 1, in the pectoral muscle, addressed front limb pain. For the second session, more points were added as the patient tolerated the first session well. Additional points included Stomach (ST) 36 for decreasing inflammation as associated with arthritis and for local pelvic limb pain; BL 15 for pain along the epaxials; BL 27 for local tension in the sacral area; BL 40 for pelvic limb and stifle pain; LI 18 for additional cervical tension; LU 1 for front limb pain and tension in the pectoral muscles, and Governor Vessel (GV) 4 for lumbar back pain. The third session occurred several months after the first two sessions due to conflicts with scheduling. 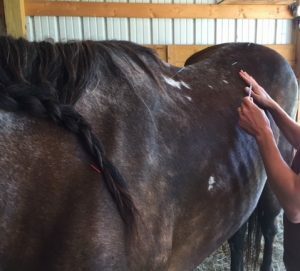 The patient had been more active in the pasture the previous two days from chasing newly added calves away from one of the feed bunks, and was subsequently sorer along the longissimus dorsi, pectorals, shoulders and gluteal muscles than before. 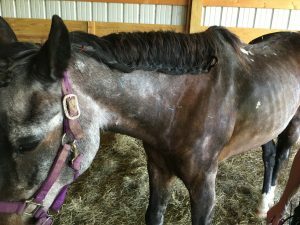 Brownie showed less tolerance to being needled, so massage therapy was used on the pectoral and caudal neck muscles. 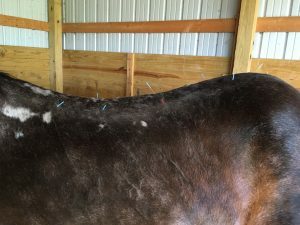 The horse was given one gram of phenylbutazone after the acupuncture treatment. In addition to the common points listed initially, BL 18 (13th ICS) and BL 23 were added for additional longissimus dorsi tension and trigger points. Outcomes, Discussions, and References: During the first two sessions, the patient’s demeanor changed from nuzzling pockets for treats and looking for food to standing with his head dropped, ears relaxed. The respiratory rate decreased from 14 breaths per minute to 10 breaths per minute, and respirations were deeper. Intestinal motility improved with more consistent gut sounds throughout all four quadrants. 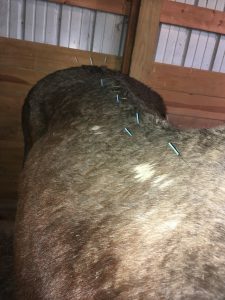 After all three sessions, the owner reported improved gait quality as the horse would walk up the hill to the feed bunk rather than cut the hill at an angle. This gait change lasted for one to two days after each session. The patient had received non-steroidal anti-inflammatories without acupuncture on previous occasions, and the owner did not note a change in the path up the hill afterwards.